Hitachi has had a long history with compact excavators. Leveraging its own engineering and technology, Hitachi built its first hydraulic excavator — the 6-metric-ton UH03 compact machine — in 1965. The EX60 was introduced in 1987. The EX27U, EX35U and EX50U followed in 2000 and the EX17U in 2001. The ZX60USB-3 was an ultra-short radius machine when launched in 2008. Hitachi compacts have progressively become more efficient, reliable and durable, as well as smoother to operate and easier to maintain, says Hitachi. The company just released its sixth compact model — the ZX30U-5 — which provides customers an alternative to the popular 3- to 4-metric-ton size class of compact excavators. Hitachi makes a wide variety of excavators ranging from super-small compacts to massive machines used in mines and quarries. The company’s compact excavator lineup includes the ZX17U-5, ZX26U-5, ZX30U-5, ZX35U-5, ZX50U-5 and ZX60USB-5. The ZX17U-5, ZX26U-5 and ZX30U-5 are the smallest excavators Hitachi sells in North America. These tiny titans are powerful and designed to keep their tails close to their tracks rather than bashing into fences or walls. The company has reduced the size and footprint without sacrificing the Hitachi qualities customers have come to expect — long life, high productivity, multifunction operations, smooth hydraulics and easy maintenance, says Hitachi. The ZX35U-5, ZX50U-5 and ZX60USB-5 deliver the same efficiency, reliability and durability as the preceding Dash-3 Series, with numerous customer-driven enhancements, says Hitachi. Their nimble yet durable design makes it easy for operators to squeeze in and out of small spaces. This makes the machines particularly well suited for rental, commercial/residential building, landscaping, underground and site development segments. With a canopy option now available on Hitachi’s ZX60USB-5, all of Hitachi’s compact excavators now have a canopy option available to customers. This provides a cost-effective alternative to the cab and lets customers take advantage of lower costs. Hitachi recently extended its standard full-machine warranty on all six compact excavators to two years/2,000 hours. The standard warranty now promises that Hitachi will fix any defects in materials or workmanship for two years after delivery or 2,000 hours — whichever comes first. The previous standard warranty was for one year. 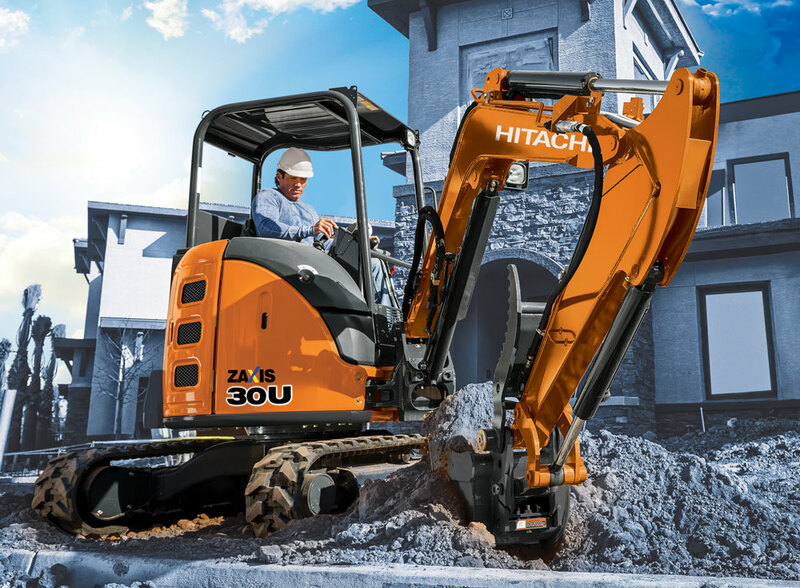 “If you’re in the market for a compact excavator, take these three things into consideration,” says Jonathan Spendlove, product marketing manager at Hitachi Construction Machinery Americas. Learn more about Hitachi here.